These Chocolate Nut Butter Overnight Oats are the ultimate breakfast comfort food. 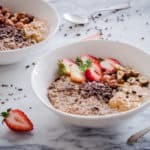 Not only do they take just 5 minutes to throw together, but they taste absolutely delicious and will satisfy any sweet breakfast cravings you have! Everyone has their own overnight oats recipe, and this is mine. I love anything chocolatey so it seemed only right to add cacao to these oats. Mixed with creamy almond or coconut milk, it’s a delicious treat for your morning meal! The toppings are where it gets really decadent though. 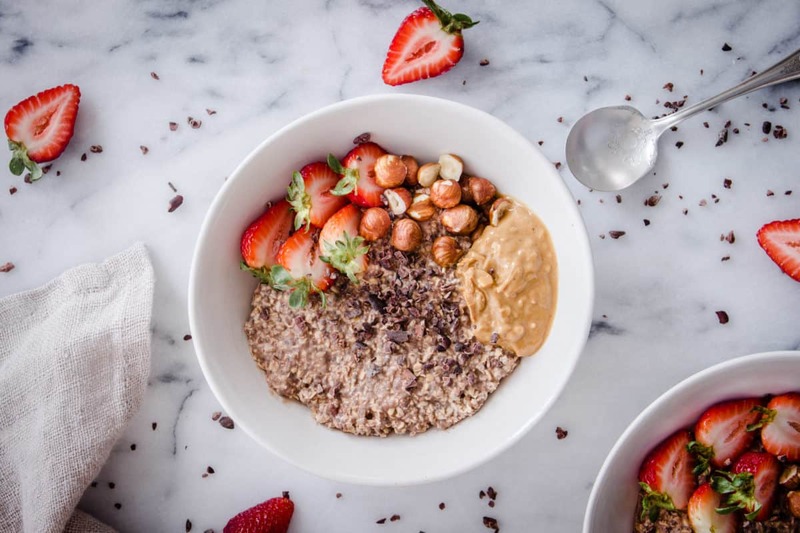 Fresh strawberries, cacao nibs, hazelnuts and a big dollop of creamy almond butter take this meal to the next level and make it a visual treat as well as one for the tastebuds. These Chocolate Nut Butter Overnight Oats are great because they’ll keep you satisfied all morning. 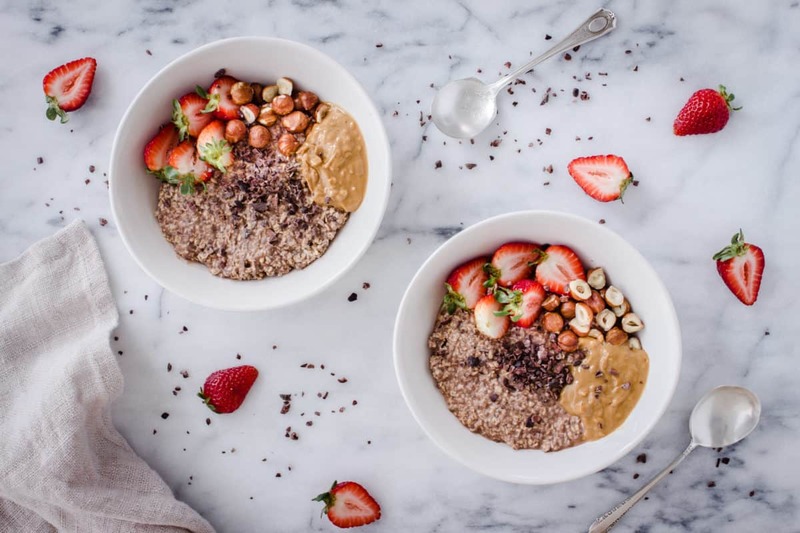 There’s plenty of protein in the form of nuts and nut butter to keep you feeling full, and the oats will energise you for the day! They’re also incredibly simple to make, as all you have to do is mix the ingredients together and store in the fridge overnight. A simple, nutritious and delicious breakfast? What more could you want?! 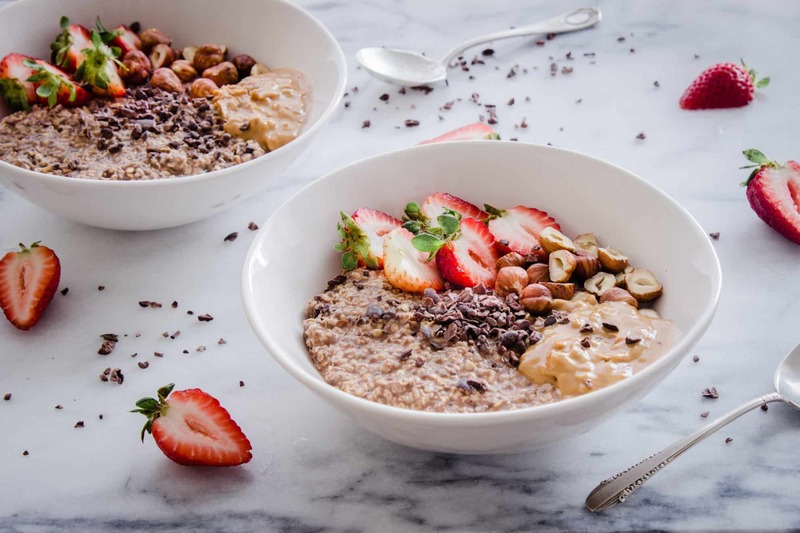 For a delicious but healthy breakfast, try these Chocolate Nut Butter Overnight Oats (vegan & gf). They take 5 minutes to prepare and can be customised with your favourite nut butter! Divide the oats, milk, chia, cacao, maple syrup and cinnamon equally between two glass jars and give a good stir to the mixtures. Place in the fridge overnight to allow the oat mixture to firm up. Remove and decorate with the nut butter, strawberries, cacao nibs and hazelnuts. If you like a sweeter breakfast then add an extra drizzle of maple syrup too!